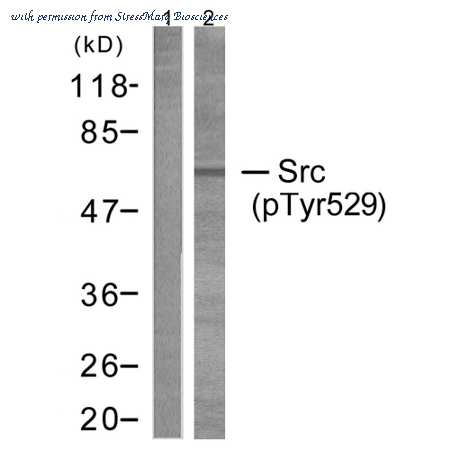 The SRC antibody from Proteintech is a rabbit polyclonal antibody to a recombinant protein of human SRC. This antibody recognizes human, mouse, rat, hamster antigen. The SRC antibody has been validated for the following applications: ELISA, IP, FC, IF, WB, IHC analysis. Detection of Human and Rat Src by Western Blot. Western blot shows lysates of MCF-7 human breast cancer cell line, Y3-Ag rat myeloid cell line, and Rat-2 rat embryonic fibroblast cell line. PVDF membrane was probed with 1 ╡g/mL of Human/Mouse/Rat Src Monoclonal Antibody (Catalog # MAB3389) followed by HRP-conjugated Anti-Mouse IgG Secondary Antibody (Catalog # HAF007 ). A specific band was detected for Src at approximately 60 kDa (as indicated). This experiment was conducted under reducing conditions and using Immunoblot Buffer Group 3 . 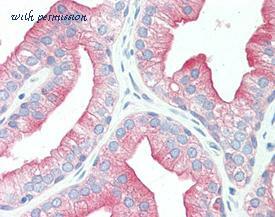 Src in Human Colon. Src was detected in immersion fixed paraffin-embedded sections of human colon using 15 ug/mL Human/Mouse/Rat Src Antigen Affinity-purified Polyclonal Antibody (Catalog # AF3389) overnight at 4 ░C. Tissue was stained with the Anti-Goat HRP-DAB Cell & Tissue Staining Kit (brown; Catalog # CTS008 ) and counterstained with hematoxylin (blue). View our protocol for Chromogenic IHC Staining of Paraffin-embedded Tissue Sections . 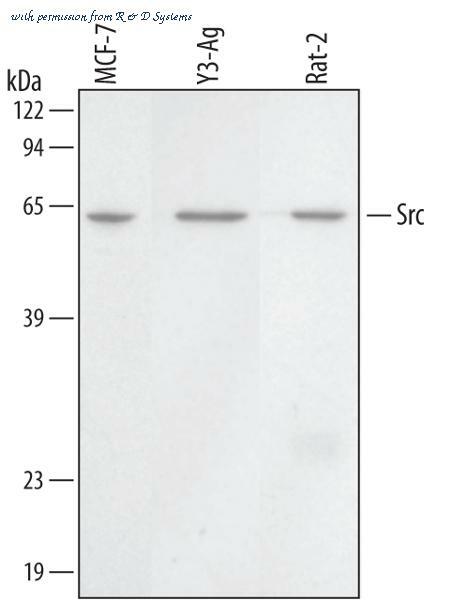 Western Blot: Src Antibody (5A18) [NBP1-19188] - Human breast cancer cell line MDA-MB-231 was treated with carboplatin for 72 hours and the expression of p-Src at Y419 and total Src were detected by western blot. From a verified customer review. Western Blot: Src Antibody (JF0947) [NBP2-67167] - Analysis of Src on HUVEC cells lysates using anti-Src antibody at 1/1,000 dilution. 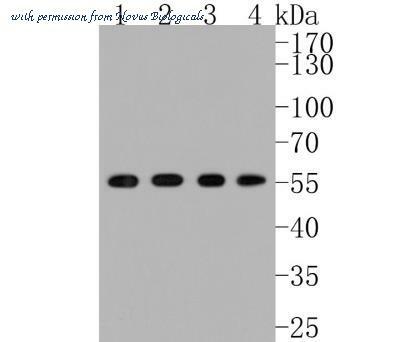 Western blot analysis of Human Embryonic kidney epithelial cell line (HEK293) lysate showing detection of ~60 kDa SRC (pTyr529) protein using Rabbit Anti-SRC (pTyr529) Polyclonal Antibody (SPC-1429). Lane 1: HEK293 cell lysates and antibody incubated with the immunizing peptide. Lane 2: HEK293 cell lysates. Load: 10 µg. 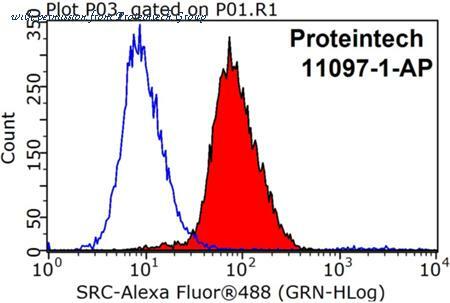 Primary Antibody: Rabbit Anti-SRC (pTyr529) Polyclonal Antibody (SPC-1429) at 1:1000. Predicted/Observed Size: ~60 kDa. 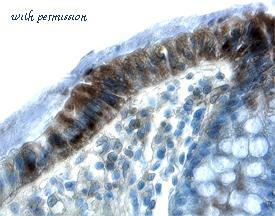 IHC Analysis: Human prostate tissue stained with Src, mAb (5A18) at 20µg/ml. Western blot analysis of Src using 20µg of whole cell lysate (Lane 2=HeLa, Lane 3=3T3, Lane 4=PC12) probed with with Src, mAb (5A18) at 1µg/ml. 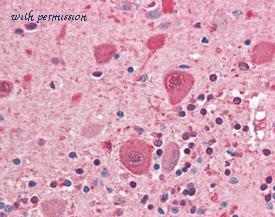 IHC Analysis: Human brain, cerebellum tissue stained with Src, pAb at 1:250. Western blot analysis of mouse testis tissue extract, probed with Src, pAb.